March | 2011 | YA? Why Not? My nearly 8 hour round trip to Cincinnati to see Carrie Ryan allowed me to finish listening to Will Grayson, Will Grayson by John Green and David Levithan. I am very happy that I finally got to this fun little gem of a story. Will Grayson, Will Grayson by John Green and David Levithan, 2010. On a cold Chicago night two teens, both named Will Grayson meet under unusual circumstances. Their meeting sets in motion a series of events that will forever change the way the Wills think of themselves as they each have a romantic change of heart. One Will Grayson must choose between his self-imposed rules for living (1. Shut up 2. Don’t care) and a shot at a real relationship with Jane. Will’s flamboyant and enormous (and ironically named) friend Tiny Cooper, when not busy writing his musical, Tiny Dancer, plots ways to bring the two together, despite Will’s resistance. The other Will Grayson’s world is shattered the night of the random meeting of the Wills, but with the help of Tiny Cooper he begins to see his life in a new way. He works up the courage to tell his mother and friends he is gay, he meets new friends, and slowly lets go of some of the anger he has kept bottled up for so long. There is a lot going on in this book! Ever wonder what goes on inside a teen guy’s head? Ask a Will Grayson. John Green and David Levithan are both giants in the YA literature world, and for good reason. They each have the ability to create characters who realistically embody the teenage experience. They are masters of teen angst without the cliché, and with the exception of Tiny Cooper, they once again succeed in presenting readers with an honest and complex portrayal of teens. Don’t get me wrong, I am not saying Tiny is not realistic. I know flamboyantly fabulous men are out there, but I thought Tiny’s character came dangerously close to being a caricature. For me, his saving grace was his heartbreaking honesty during his private moments with both Wills. Publically, he was a walking stereotype. That being said, the rest of the novel was fantastic. The audio was a special treat because I actually got to hear Tiny belt out musical numbers from his show (he’s not a very good singer, bless his heart). It took a while to get used to the different Wills, as the narrators sounded similar. But once I got to know the characters it was easy to tell them apart. This book is smart and sassy, heartbreaking and hopeful and a must read for romantics everywhere. Guys and girls alike will be able to relate to any number of characters and the struggles they face as they try to figure out who they really are. I loved this feel-good story! A word of warning, the teens in this book are realistically foul-mouthed (I now have a new favorite curse word, but I can’t say it here!). These books are now ready and waiting for you to check them out. It’s true what they say about teaching an old dog new tricks-Lexi refused to learn how to drive for my trip to Cincinnati. Before jumping to her defense with the whole opposable thumbs argument, I would like to remind you all that I have the world’s most stubborn dog and I think she won’t drive out of spite. But you are not here to read about my canine conundrums. 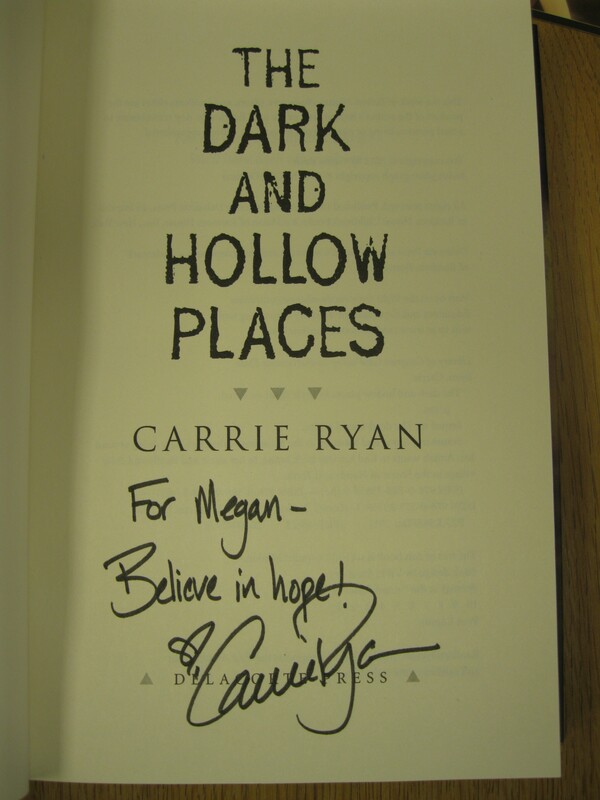 You want to know about meeting Carrie Ryan. So, without further ado (or dog related insanity) I present to you my afternoon with Carrie Ryan and 40 other fans. 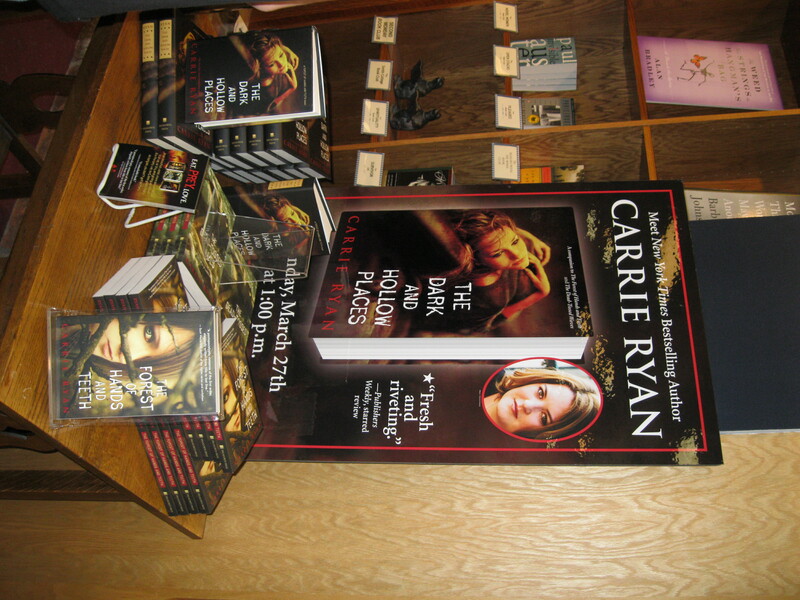 Here is the lovely display of Carrie Ryan’s books. Looking at the picture now I realize that there is not a copy of The Dead-Tossed Waves standing up for you to see. It’s a shame, because it’s a creepy cool cover. Also, check out the new cover for the paperback of The Forest of Hands and Teeth. Personally, I am not a fan. I like the original cover better. But that’s neither here nor there. What’s between the covers is the same zombie-licious story. Here’s the lovely Carrie Ryan herself, signing away! She was kind enough to sign a book for me and a book for me to give away for summer reading. I also picked up some cool swag-bookmarks and a couple of buttons. Given what I know about Ms. Ryan and her fearless ability to make terrible things happen to her beloved characters, I must confess that I am scared to read this. But…. ….maybe it will be okay? Maybe it will be a Tinkerbell situation. Maybe if I believe in hope enough it will be okay? Maybe? Please? *sigh* It’s not going to be okay, is it? I CAN’T WAIT! Carrie Ryan is a brilliant storyteller, both in print and in person, so I don’t want to ruin anything for those of you who may see her. BUT, I will say that she filled us in on the origins of her zombie obsession. She swears she’s a romantic (you wouldn’t really think so from her books) and maybe she is. She did marry the man who took her to her first zombie flick after all. That’s kind of sweet. I personally had a moment of silent bonding with her when she described a childhood trauma involving a teenaged babysitter and a horror movie. Carrie, my dad let me watch Amityville Horror when I was six or seven. I feel your pain. 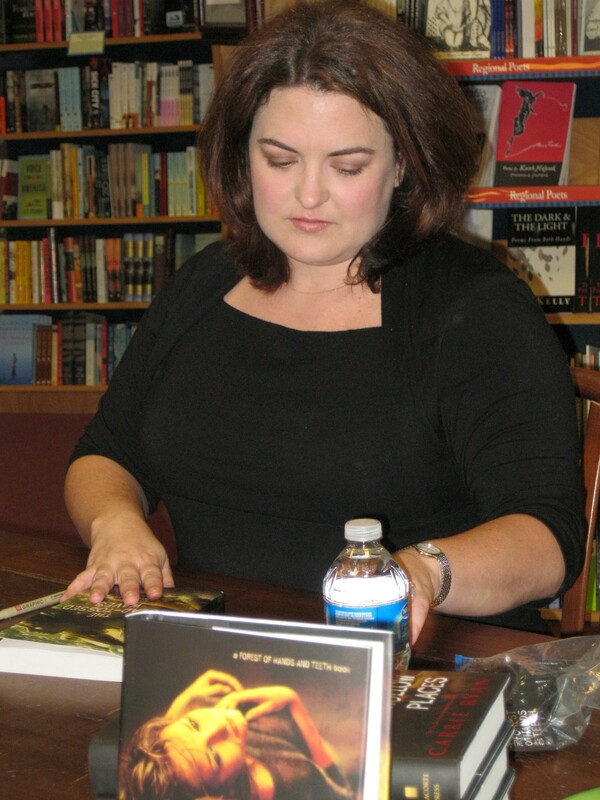 She talked about her journey to becoming a writer-and a New York Times Bestselling author at that-with her Ten Year Plan (she could have called it a Five Year Plan, because that’s all the time she needed to make it big). She talked about her writing process and told stories about her grandma and husband and cat. She talked about zombies. She talked about making her characters do more than just surviving. She talked about hope. She was amazing. What she didn’t talk about is her next book. That’s right, there is a next book! She said the next book is done and awaiting a title. It will be available next summer and it is dark, paranormal, gothic, and there is kissing. Friend, fellow author and writing partner, Saundra Mitchell, was on hand to confirm that the next book is awesome. BTW, I have only heard fantastic things about Saundra Mitchell’s new book, The Vespertine. It is currently in my house just waiting for me to read it. Hopefully the upcoming Read-a-thon will help. In the meantime, you can find more zombie stories by Carrie Ryan in a number of new anthologies. Find her in Zombies vs Unicorns, Kiss Me Deadly, and Enthralled. She decided to take “seven million zombies, throw them at the world and see what happens.” I should find out this week. The people in Mary’s small, isolated village believe they are the only remaining humans to have survived a devastating virus. After the Return of the Unconsecrated (zombies! ), the gated-off village in the middle of the Forest of Hands and Teeth is surrounded by the hungry and deadly undead. When the undead finally manage to break through the fence, Mary and the survivors must decide whether to stay and fight or flee in search of other humans. 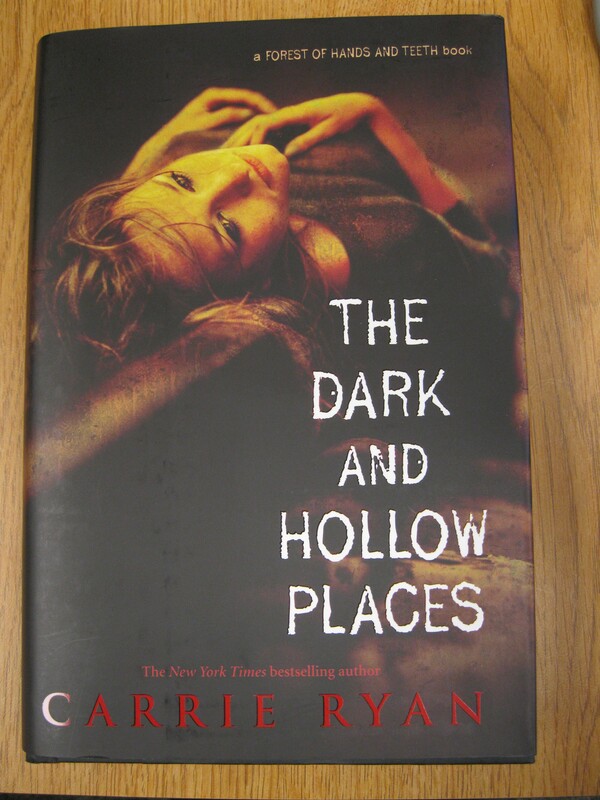 Don’t let the pretty cover fool you-this book is dark and gruesome and the author does not spare readers descriptions. The Unconsecrated sent shivers down my spine. This companion to The Forest of Hands and Teeth tells the story of another girl, Gabry. Gabry has lived her entire life in the safety of the sea town of Vista. The living dead are still a threat, but there has not been much threat from the Mudo in a long time. That changes when a group of teenagers decide to jump the protective barrier and there is an attack. Now all of her friends are dead, imprisoned, or missing. Gabry cannot live with the guilt of running away, but to save herself and her friends she must overcome her fears and learn to trust a stranger. This second book in the trilogy features a new setting, new characters, and even a new name for the undead. The pacing of this book is even more breath-taking than the first and the unpredictable twists and turns will leave readers unable to put the book down! The shocking end sets the stage for the final book. Truth be told, I don’t really know much about this one. I know it picks up where the second one ends, but I have not sought out any more information. I want to be surprised. Have I mentioned that I can’t wait! I’ll let you know next week how great this is. The other day my coworker (the other Megan) and I were lamenting the sad state of the Teen Mystery Section. I have done a number of things in an attempt to increase the circulation of these books and nothing seems to be working. Hence, the mystery. I have moved the books to different shelves, I have done Mystery displays, I have turned the books face out, I have discarded ratty old books, I have purchased shiny new books, all to no avail. I find it so strange, especially since the adult readers around here devour mysteries. Historical mysteries not your thing? How about sports mysteries? Best-selling sportswriter John Feinstein has written a number of sports-related mysteries starring teen journalists Susan Carol and Stevie. No historical or sports, you say? How about a paranormal mystery? The Body Finder and Desires of the Dead by Kimberly Derting are two paranormal mysteries starring sixteen-year-old Violet who has the ability to sense murder victims and their killers. These mysteries are creepy and suspenseful, but they also have a touch of sweet romance. Aren’t the covers gorgeous? I definitely recommend these to readers who enjoy a touch of the supernatural. Speaking of creepy, these mysteries totally gave me the heebie jeebies. Admittedly, I have not read Nightmarys yet, but that’s only because our copy was AWOL for a bit. But now it’s back and I will be checking it out soon! Not convinced? Hope about a good, old-fashioned mystery without any gimmicks. No historical setting, no sports, no supernatural. We have those! Two guys go on a cross-country bike trip. Only one comes back. What happened out there on the road? After his ex-girlfriend’s death Neily teams up with her cousin to solve the murder. Mimi heads to her dad’s remote Canadian cottage to relax after a stressful freshman year in college. Upon her arrival she discovers a stranger living there. She also has a stalker. Could it be the stranger or someone else? Now do you see why it is such a mystery that the Teen Mysteries just sit there looking so sad and lonely? Don’t these sound great? Don’t you want to read one of them (and check out some of the other awesome mysteries that are hanging around next to them)? Well, chop, chop, get to it! Boy do I love NetGalley.com! I have been fortunate to get some wonderful ARCs from them. Most recently I read Girl Wonder, by Alexa Martin. I confess that I decided to request this title based on the cover alone. After my own brief time as a pink-haired librarian, I kind of have a soft spot for those crazy brave souls who choose bubble-gum colored locks. Lucky for me, judging a book by its cover paid off. Everyone knows it’s hard to be the new girl, but for Charlotte Locke it seems impossible. It’s hard to fit in when you move during your senior year. To make matters worse, because of her math-related learning disability, she is not allowed into the gifted program. Things at home are bleak too. Charlotte stresses about her mom’s health, when her dad isn’t away talking about his best-selling book he nags her about college applications and learning to drive, and as usual, her genius younger brother continues to outshines her in all aspects of life. Things start to look up when she meets Amanda. Amanda is the school’s fearless, beautiful, confident, rich, pink-haired Girl Wonder. Charlotte’s role as Amanda’s new side-kick provides instant popularity and access to Neal, the hottie captain of the debate team. Charlotte joins the debate team to pad her college applications and to get close to Neal. Soon Charlotte and Neal begin a physical, but secret relationship. As Charlotte falls in love she fails to notice the small shifts occurring in her relationships and with her family until it is too late. The first thing that comes to mind after reading this book is “all that glitters is not gold.” It’s a difficult lesson to learn, but everyone goes through it at some point. Charlotte is a perfectly flawed main character and the author beautifully captures the recklessness, exuberance, and insecurities that characterize the typical high school experience. Despite relying on a number of clichés, Girl Wonder is an honest and touching look at the pressures that teens feel as they try to find their place among their peers, within their families, and in the world at large. Charlotte makes mistakes along the way, but her journey has a satisfying end that leaves her a stronger, more confident person. This ending is not marred by its predictability because readers will be cheering for Charlotte all the way. There are plenty of lesson to learned in this debut novel, but none come off as preachy. This book will appeal to more mature fans of realistic fiction, chick lit, and stories with strong female characters. This book does contain mature content and may not be appropriate for younger readers. Pair this book with Mostly Good Girls by Leila Sales. Fans of Meg Cabot and Sarah Dessen will also appreciate this coming of age story. Hi Everyone! Wow, this weekend was jam-packed with activities for me. I started a home improvement project, spent a lovely day with my family on Saturday, and learned how to color traditional Ukrainian eggs. I spent enough time in my car to finish listening to A Red Herring Without Mustard by Alan Bradley (loved) and I managed to squeeze in enough dog walking to finish listening to The Abortionist’s Daughter by Elisabeth Hyde (really good too). As for reading, well, I barely cracked a spine. Ok, first things first: the eggs. As some of you may know, I am not a Crafty McCrafterson, but I am pretty pleased with my creations! 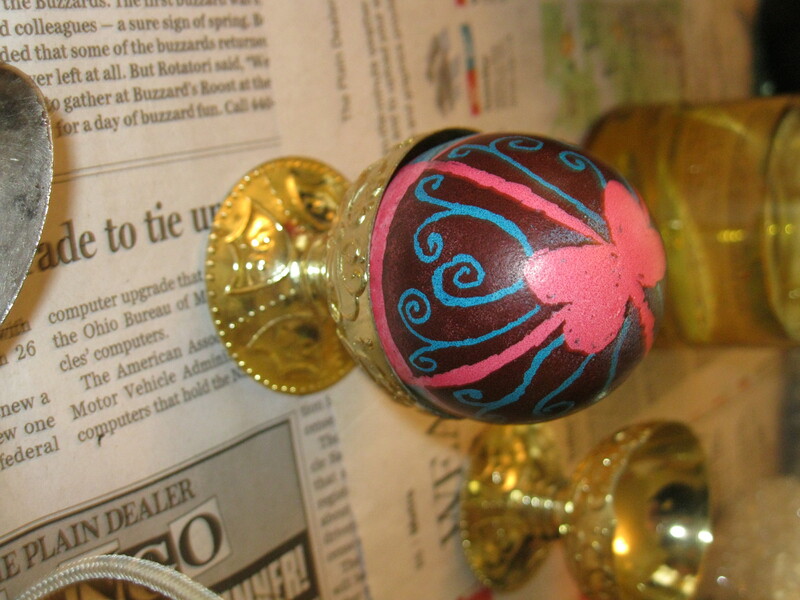 I was really nervous about learning how to create pysanky because it seemed like a complicated process. 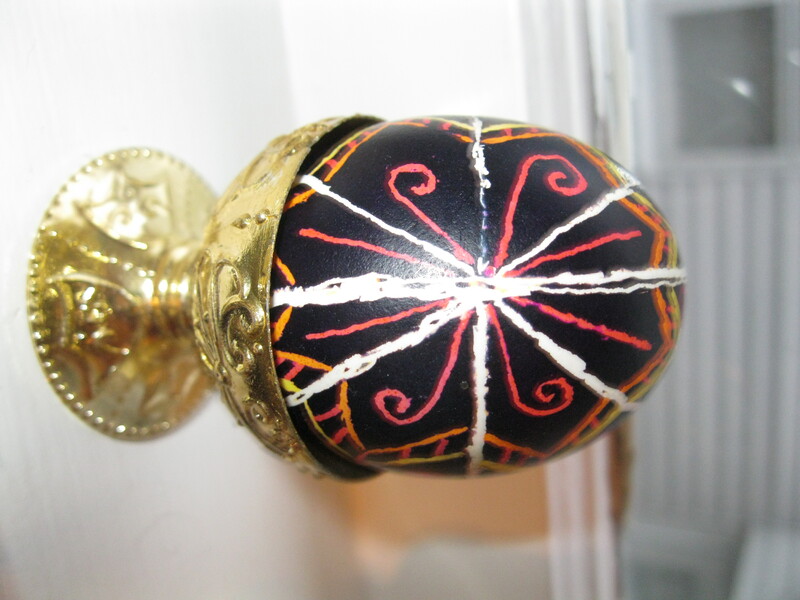 The word pysanky comes from the Ukrainian word that means “to write” and that is exactly what you do. Using a tiny stylus you literally write or draw on your egg using melted beeswax. Once you draw your initial design you dye your first color. Everything under the wax stays white and the rest is your first color. Then you add more details to your design and dye again, repeating the steps with as many colors as you can. The lightest colors get dyed first, and you get darker as you go along. 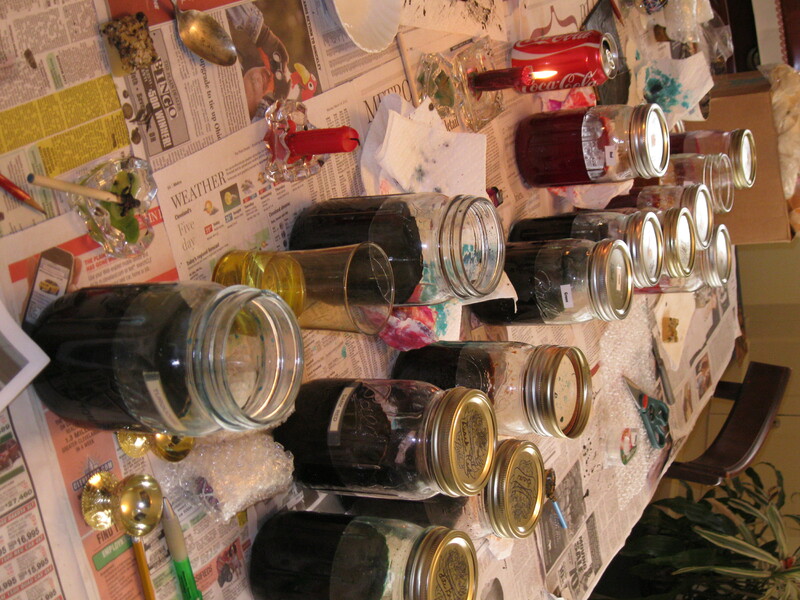 Here are all the jars of dye. If you look closely you can also see the drawing tools, hunks of beeswax, and the candles used to melt the wax. There were tons of colors! I was surprised to discover how beautiful the nutmeg brown was. It ended up being my favorite. 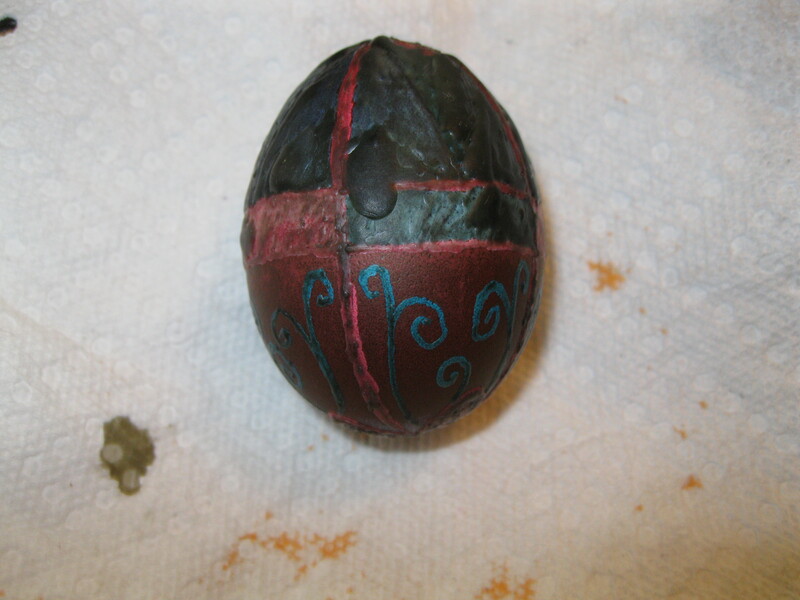 Here is one of my wax covered eggs. You can see that I have used pink and turquoise. What you can’t see, because it is under all that black wax, is a lovely dark blue. Here is what was under all that wax! This one I did free-hand. I like the colors, but I prefer the others that I did following a pattern. I guess I’m old-fashioned that way (tee hee). Here is my take on a traditional star pattern. This is actually my first egg. This one is my favorite! I got a little confused with the pattern (wheat), but I think it still turned out pretty nice. 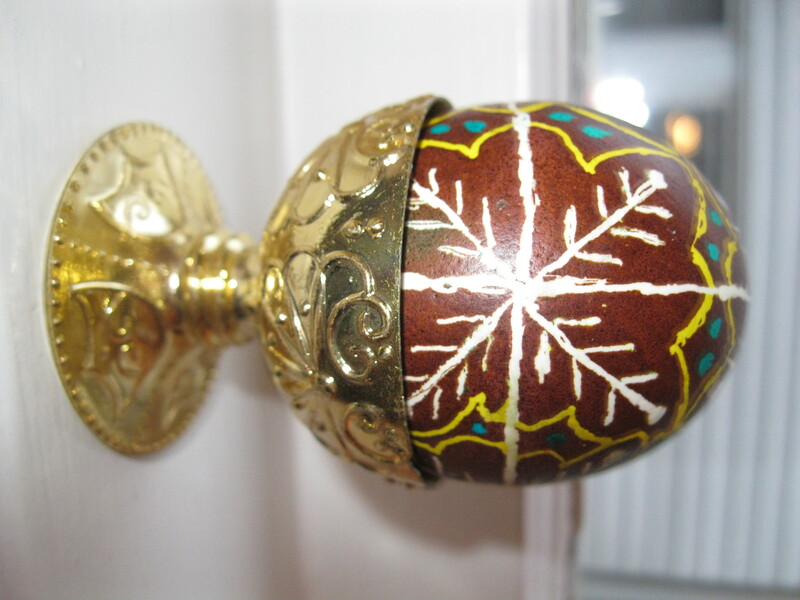 Traditionally pysanky that depict plant motifs guarantee a good harvest. I just like the turquoise and brown together! And now, a little book talk. Actually, more like book promises. I promise to review Alex Martin’s debut novel, Girl Wonder coming this week. I promise to talk about how great Will Grayson, Will Grayson by John Green and David Levithan is. I also promise to read a graphic novel or two this week. I have seriously been slacking on that lately.